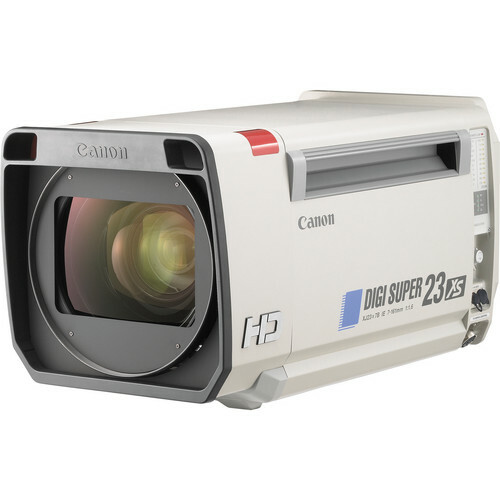 The DIGISUPER 23 xs XJ23x7B IE-D 7 to 161mm Studio Lens from Canon utilizes the Power Optical System and is compact enough for use with a portable camera. The DIGISUPER 23 xs provides an excellent optical performance and ease of operation. The DIGISUPER 23 xs lens has zero zooming effect of focus throughout the whole zoom range, thanks to the Constant Angle Focusing System (CAFS). It offers a choice of detectable signals such as an encoder data signal, an analog data signal or a serial data signal. The lens achieves 13-bit zoom and focus repeatability and offers bi-directional serial data communication in order to facilitate highly accurate and smooth movements that are essential for robotics and virtual applications. The digital servo system is reliable, consistent, and is not affected by electric interference. The PC connection for remote control or diagnostics can be accomplished via a communication interface on the lens and personal computer with software (sold separately).